Several series from Marvel Comics describing its characters in encyclopedia format. The project was instigated by Promoted Fanboy and popular writer and editor Mark Gruenwald; another prominent OHOTMU creator is diagram artist Eliot R. Brown. The first OHOTMU-style pages came as back-ups in the three-issue miniseries Contest of Champions (also written by Gruenwald) and proved popular enough for Marvel to go with a full-sized series containing nothing but encyclopedic entries. 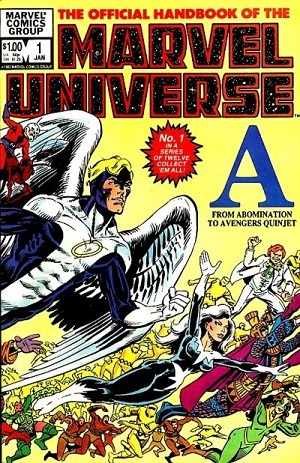 The original Official Handbook of the Marvel Universe (abbreviated to OHOTMU) started coming out in 1982 (cover dates January 1983 to April 1984), about two years before the similar Who's Who at DC Comics, describing characters in alphabetical order over 15 issues. The series tried to be as scientifically accurate as possible, which may cause unintentional amusement as entries repeatedly explained away the same violations of physics (typically Shapeshifter Baggage, Square-Cube Law, or some Required Secondary Powers). It also made Continuity Snarls very obvious when a character's history was laid out all at once. Official Handbook of the Marvel Universe, Deluxe Edition (abbreviated to OHOTMUDE), cover dates December 1985-February 1988; 20 issues at 64 pages each without ads. The last five issues were the Book of the Dead, devoted to dead characters. Certain traits of comic books made this a somewhat unwise decision. A 1989 update ran for nine more issues. This is often considered the best of the early series, though the first OHOTMU did include the occasional entry not found in the Deluxe Edition. Marvel also released one for the licensed series Conan. Collected two issues to a volume shortly after the time of its release, in color. Collected in three black and white Essentials, plus another Essential for the update, in 2006. Official Handbook of the Marvel Universe, Master Edition. Released in 1990-1993, this was 36 issues in looseleaf format. It is generally considered inferior because the format greatly reduced the amount of text that could be used for many entries. Collected in three black and white Essentials in 2008. Official Handbook of the Marvel Universe. In 2004-2005, Marvel began releasing handbooks with various themes, such as Spider-Man or The Golden Age of Comic Books. This was followed by an alphabetical series made up mostly of other characters, and several updates. See Marvel's OHOTMU web page here. Collected with more updates as Official Handbook of the Marvel Universe Premiere Hardcovers in 2008-2010. Trade paperbacks reprinting the hardcovers and containing yet more updates came out for a while, but the series was cancelled before it ended. Associated titles include the Marvel Atlas two-part series and character or team-specific handbooks, usually one a month, such as the Iron Manuals Mk. 2 and Mk. 3, Deadpool: Rank and Foul, and Encyclopedia Mythologica. Compare with DC Comics' equivalents, Who's Who: The Definitive Directory of the DC Universe and Secret Files and Origins. All There in the Manual: Many facts and contradictions from the comics were explained in the series. Armed with Canon: Some of the explanations of events within the comics have been... controversial. For example, The Man-Thing's "touch that burns anything that knows fear" was explained as an acid touch, rather than a supernatural ability. Wolverine's claws were shown as bionic implants. Later stories ignored this and had them be natural. The wackier stories in She Hulk were explained as having occurred, just not quite the way the comics showed. Exiled From Continuity: ROM Spaceknight got an entry once, despite Marvel not owning the rights to the character. Fan Service: Of the nerd type, though some of the illustrations could also be considered quite attractive. For fans of engineering, the inner workings of technological devices from Hawkeye's Trick Arrows to Wolverine's claws to the Avengers' Quinjet and more were given detailed schematics. Power Levels: Originally, the OHOTMU measured the strength of characters by how much weight they could lift or press (the maximum was 100 tons.) This was later replaced with bar-type tables. Squirrel Girl has maximum level in all stats, but this is an in-joke; she has never shown such levels of power in the comics. Most of her victories against powerful villains have been off-panel, and the on-panel ones tend toward silly contrivances rather than Power Levels. Promoted Fanboy: Besides Gruenwald, the contributors to the website The Unofficial Appendix To The Handbook Of The Marvel Universe did such a good job covering characters not listed in the official comics that Marvel actually hired some of them to produce the latest issues! Trope Maker: For the whole concept of doing superhero encyclopedias in comic book format, soon imitated by DC and other companies. This page was last edited on 26 October 2018, at 23:35.